Hillcrest Baptist Church members Collis Nelson, Marcus Milner, Rev. David Williams and Buddy Buchanan honor church member Douglas Way (seated). 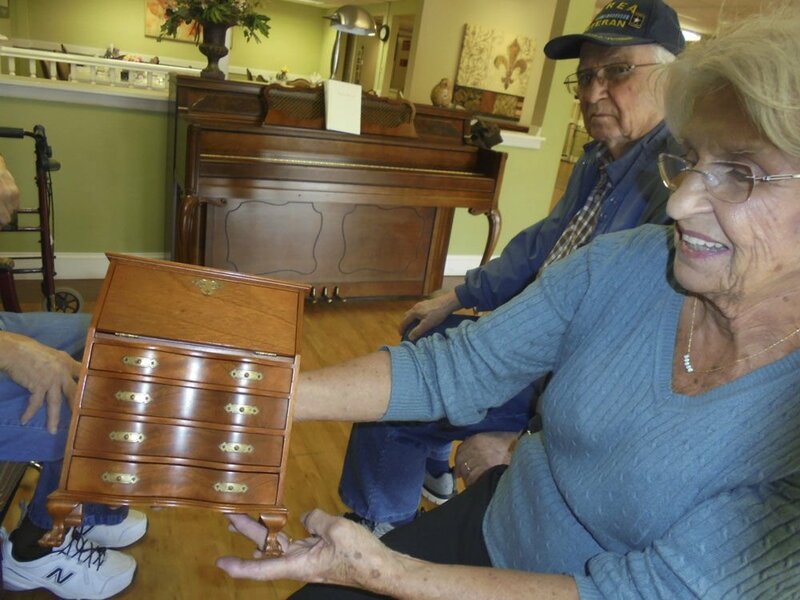 A miniature chest handmade by Doug Way. World War II veteran, 98-year-old Douglas Way recalls his days aboard a landing ship during the war. One of those churches was Morristown’s Hillcrest Baptist Church, which opened in 1954 in its large completed basement with Rev. Dallas Bibbins serving as its first minister. A later minister, Horace Hamm, who had served as a military chaplain, became a church legend. With a beautiful sanctuary later completed the now-thriving church offers a food pantry and clothing for the changing neighborhood, and has now seen eight ministers, with Rev. David Williams now having served as the church pastor for 18 years. Hillcrest recently decided to honor its oldest known male member, 98-year-old Douglas “Doug” Way for his World War II Navy service, as well as for his service to the church and community. For the occasion Rev. 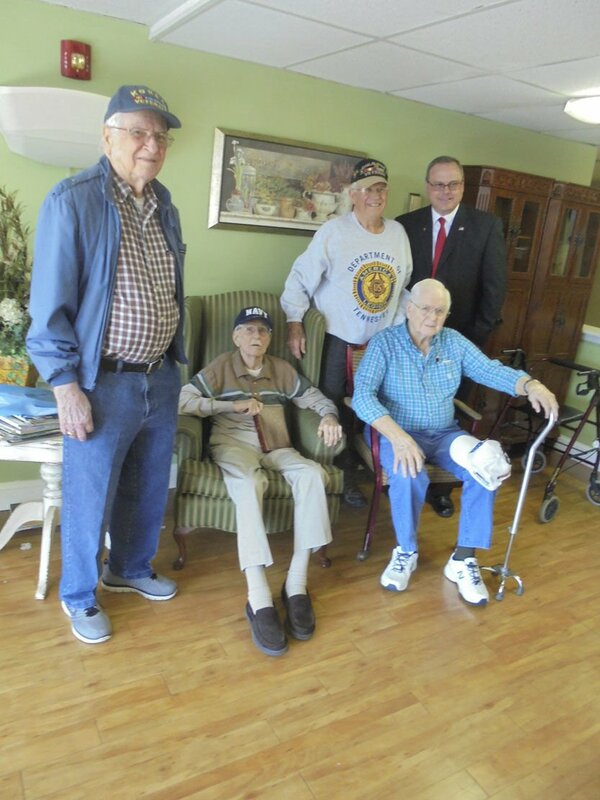 Williams was joined by Army veteran Collis Nelson, and Korean War Army veterans Marcus Mitner and Buddy Buchanan. Also on hand was Sue Harrell, who had been Doug’s neighbor for more than 50 years. Born Jan. 10, 1921 in Philadelphia, Pennsylvania, Doug was one of two sons of Herman and Ethel Way, joined by sisters Pauline, Dorothy and Beatrice. His older brother, John, now 99, now lives in Atlanta. Moving soon from Philadelphia, the Way family moved to Washington, D.C., where Doug earned his education. Following his schooling, he worked for Washington Woodcrafting, where he began developing his wood working skills by drawing furniture designs which were sold to various countries. With the coming of World War II, Doug joined the Navy soon after the attack on Pearl Harbor. Heading to the Great Lakes for boot camp, he still has a photo of his first leave home in late January 1942. Following his training, he was assigned to the LST 209 (landing ship tank) which was later named the U.S.S. Bamberg County. The versatile 328-by-50-foot ship was served by a crew of around 125 men and officers. After a shakedown cruise in the Chesapeake Bay and with Lt. Frank Oberg in command the ship left for the coast of Africa in August 1943. After arriving in Bizerte, Tunisia, the ship made four trips to carry critically needed equipment to the Italian front. Then joining a convoy of 10 LSTs, the 209 sailed through the Suez Canal to Calcutta, where she was loaded with 14 M-3 “General Lee” tanks for Burma before returning to India. In February 1944, the 209 sailed to the British Isles to train for the Invasion of France (D-Day). On June 6, 1944, she unloaded various troops, including the famed British “Desert Rats” on Gold Beach. During the rest of the month, the 209 moved between Britain and France in support of the landing. In July she was refitted to carry railway cars across the English Channel to Cherbourg. For the rest of the war in Europe, she transported troops from England to France and Belgium. In July 1945, she returned to Norfolk, Virginia, loaded with a patrol boat and former Air Force prisoners of war. Unloading the men in Virginia, the 209 took the torpedo boat to New York before sailing to Mobile to be fitted with improvements for potential service in the Pacific. “I steered the boat,” Doug said about his service. “Where ever we went, I did the steering. We were based on a naval base in England and the first combat I saw was from the air. We got bombed quite a bit and I hid under the bed. I had been through the Strait of Gibraltar to Morocco and Italy, where they were fighting, and we saw some heavy combat on D-day. Returning home from the war, Doug and his wife Charlotte moved to a job in Mississippi. Brother John, who had moved to Morristown to become a key citizen, prodded Doug and Charlotte to move up and join him. John eventually managed the Morristown Housing Authority as well as serve as the Hillcrest church minister of music. Around 1967, Doug brought Charlotte to Morristown, where he took a job as a furniture designer with Shelby Williams. “He worked with chairs and had a big responsibility,” Collis said. Doug’s work as Shelby Williams evolved into a hobby at home, where he built two beautiful Chris Craft-patterned wooden motorboats, as well as an immaculate wooden houseboat. On his time off, Doug and Charlotte, who had no children, spent a good deal of time on their houseboat on Cherokee Lake. Neighbor Sue also brought out a precise scale model of Doug’s World War II LST 209 which he made entirely by hand, as well as a tiny working chest he had also built. Want more history? Go to the Citizen Tribune archives by clicking here. -Jim Claborn is a retired history teacher and a historical reenactor, as well as a published historian.